In 2005, Francis and I were asked by Bill Gregory if we would be willing to be interviewed on Portland Community Television for a program he had helped produce called “The Second Act.” Sponsored by the Maine Senior Guide to celebrate “the gifts and vitality of people in the second half of their lives,” Bill told us they were curious about what active elders are doing in their later years. We agreed, because having let go directorship of Portland Yoga Studio which we had founded sixteen years earlier, we had been pondering that very thing. Susan Hirsch was the interviewer at that time. 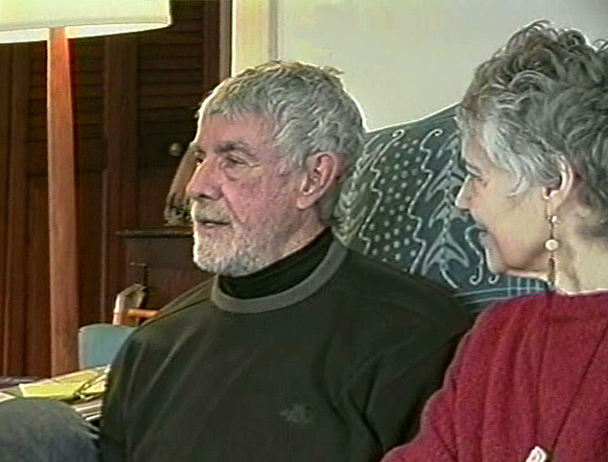 This photo of Francis and me is taken from that television interview. 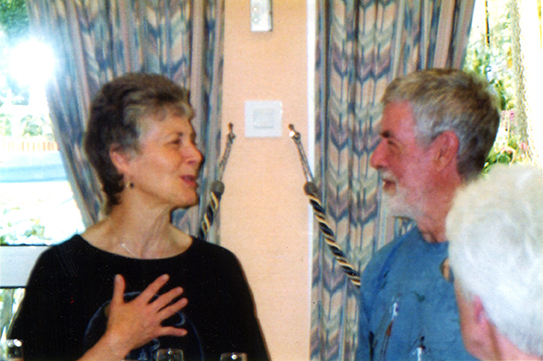 In 2012, shortly after the publication of Sing to Me and I Will Hear You – The Poems, Bill himself interviewed Elaine. The Dances played a central role in our lives, and in particular, as Francis approached his death. The “song” referred to in my book titles, Sing to Me and I Will Hear You . . . is the song Francis asked me to sing for him as he died – Song of Songs 8:6: “Set me as a seal upon your heart, for love is as strong as death.” Its melody was created by Dr. Neil Douglas-Klotz, the prolific Aramaic scholar who also created “dances” with the Lord’s Prayer, and the words of Jesus, including his Beatitudes. “Saadi,” as we call him (by his Sufi name), said that these meditative body prayers are “spiritual practices” more than “dances” as such. I have learned the Aramaic, and the melodies and movements from him, by participating in his retreats since 1996. And Francis, who also took several of those retreats with Saadi, also practiced them with me in preparation for our bringing them to CORPUS Conferences. For more information about the Dances of Universal Peace in general, click here. For an overview of my work as a certified leader of the Dances of Universal Peace, click here. In similar fashion, with Saadi’s permission, I also led the Lord’s Prayer and the Beatitudes of Jesus. Here are photos of Francis and me teaching a workshop on how to pronounce and chant the Beatitudes. 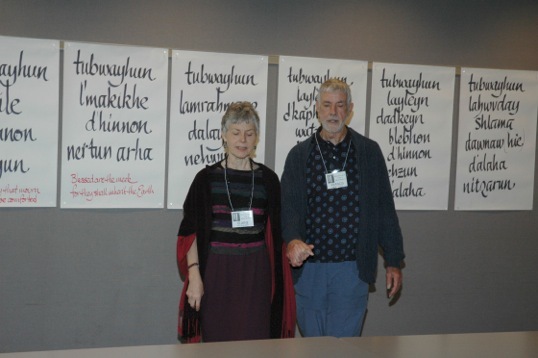 The words in Aramaic posted on the wall behind us were printed in calligraphy for me by another leader of the Dances, Mike Muraq’abba Monahan. During that annual, national CORPUS Conference in 2005, after teaching this workshop on Saturday – on Sunday, Francis and I chanted the Beatitudes with their simple movements while facing those gathered for our closing Eucharistic liturgy. Because it was during the Mass, we did it within eight minutes, even though, normally, it takes an hour or more to pray them, as Dr. Douglas-Klotz did on this occasion (above) in Ohio. Our permaculture Eden came to life when the 86 perennials plus 103 daffodil bulbs planted in the fall of 2007 bloomed by spring/summer of 2008. Many people came to the three formal and one informal open houses we offered from June through September. Permaculture Permablitz 10 Years Later! Dear Friends, including former students: Come to my home this Saturday, November 5, for a unique kind of “Permablitz”! The 8,000 sq ft lot that Francis and I created between 2006 and 2009, turning it into an edible landscape with fruit trees etc, is a veritable permaculture “eden.” But since it’s one of the oldest permaculture demonstration sites, because, e.g. the pond liner is beginning to sink into the pond by now – my friends in the Resilience Hub & Portland Maine Permaculture Meetup will be here from 9 to 2:30, to help me restore it. We could use a little help. I’ve ordered a big pot of soup from the Portland Food Coop, and the “permies” and I are providing potluck food, desserts too. So if you don’t have time to do likewise, you could simply just come and join in. Permablitzes, are great fun, offering conversation and camaraderie as well as experiential learning for all! And besides all that – I’d love to see you again. At the final check-in of three, during today’s permablitz, several people used the expression “fun.” And we sure accomplished a lot working in teams. The plum and cherry trees were pruned, wet paths were filled in with sheet mulched and topped-with-wood chips, new strawberry patches were created, the central garden was rejuvenated with fresh compost I ordered from Jordan’s Farms and topped with straw, two new compost bins were created, and – la piece de resistance – the pond was drained. A surprise decision (upon discovery that the pond liner underneath the top pond liner) had a leak in it is this: In May a special kind of educational workshop will be held when this hole of a pond will be recreated. People raved about the soup I had ordered from Portland Food Coop, and the variety of healthy snacks provided. And – it was my joy to be able to give away some permaculture items stored in a corner of my cellar (like a Sun Oven) in exchange for this generous free labor I was given today. I sing the praise of bartering, collaborating and community! 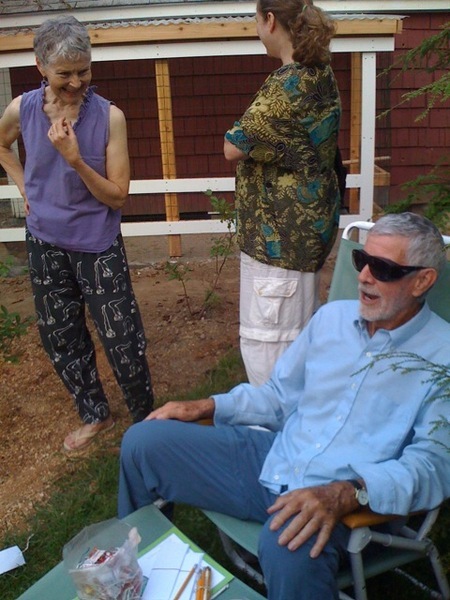 But Francis and I didn’t know that when we signed up for a retreat with Joanna Macy, — “Taking Heart in Rough Times.” Her specialties listed on the brochure next to her smiling wise woman face read: “eco-philosopher, living systems theorist and Buddhist scholar.” She’s 76. We almost didn’t go. Sleeping in unheated cabins? In October, in Maine? But my unforgettable memory of Joanna’s signature ritual or exercise — “The Council of All Beings” — convinced me. If her work alone, led by another, left such a deep impression, imagine a weekend led by Joanna herself!! Francis joined me, unheated cabins or not. The meeting rooms at least were heated. So we packed our sleeping bags and drove north to Hidden Valley Camp near Camden Maine. We were in the forest, a healing setting for a weekend billed to address the rough times disheartening us. The spacious meeting room was suffused with light. Windows encircling high ceilings kept us close to scampering squirrels and swaying branches of the forest in which we were cradled. I breathed easily. The hardwood floors of our gathering space were covered with large rugs, quilt-like. Generous volunteers brought them from home for our comfort. Participants’ colorful cushions, blankets and floor chairs were surrounded by benches, an altogether relaxing environment for challenging work. It gave me a sense of urgency. “While the agricultural revolution took centuries, and the industrial revolution took generations, this ecological revolution has to happen within a matter of a few years.” * What triggers and abets it is our current “industrial growth society’s” (IGS) fixation on unending exponential growth, money at all costs. David Korten, a founder of “YES! a Journal of Positive Futures”, calls it a cancer. So why would such a message inflame my imagination? Because, according to systems theory, although “positive disintegration” can feel like dying, it spurs “exploratory self-reorganization.” Structural “green” alternatives to the IGS’s exploitation are emerging worldwide. For example, in designing projects, sustainability principles like the “three bottom lines” take into consideration not only economic, but societal and environmental factors as well. Alternatives to unsustainable ways are sprouting everywhere, “like a faint green haze over everything.” Lifestyles that look marginal now can save us from panic or paralysis when the trauma hits hardest. Like Joanna, we can welcome the Great Turning as “high adventure.” The chaos is seedbed for the future. To save not only our planet but ourselves we must be converted from our species arrogance which makes us exploiters “using the earth as supply house and sewer.” * If instead we celebrate our interconnection with all beings, we heal not only our separation from nature, but our sense of alienation. Joanna’s message burns within me because it’s a call to transformation, a call to grow into a wider, deeper experience of who we are. It’s a homecoming, finding our place and role in the universe. “Our true nature is far more ancient, more encompassing than the separate self defined by habit and society. We are as intrinsic to our living world as rivers and trees, woven of the same intricate flows of matter/energy/ and mind.” * Our bodies are terrestrial and oceanic, we are the stuff of stars. Because we have been evolved into self-reflexive consciousness, we are the earth itself, knowing itself through us. One prayer repeated often during the retreat was the silent circle “Elm Dance.” Participants walk to four beats of movement alternating with four beats of stillness to a haunting Latvian melody. The Elm Dance originates in Joanna’s “Despair and Empowerment” work with the people of Novozybko, the town most devastated by the Chernobyl catastrophe. Lovers of the forest since ancient times, these people are now shut out from it, perhaps forever. With the Elm Dance, uplifted arms swaying in unison powerfully represent the forests our prayers would heal. This retreat turned on lights in my psyche to find my way in the dark for the rest of my journey. Is the fire ignited in me by this “bodhisattva ablaze” the same fire Jesus spoke about? “I have come to bring fire to the earth, and how I wish it were blazing already!” (Luke 12:49) I think so. * Macy, Joanna R. and Molly Young Brown. Coming Back to Life, Practices to Reconnect Our Lives, Our World. BC Canada. New Society Publishers, 1998. Toward the end of the 100 days since Francis and I learned he had cancer, he found strength in the chants he had learned with me from Dr. Neil Douglas-Klotz. I also related to them a suggestion our good friend Nicki had made the day before. During our telephone conversation, I had sung one of the chants for her. That’s when Nicki got the idea we should record Francis and me singing them. I had thought of inquiring through lotsahelpinghands if anyone had the skills to do that for us. But when Lee and Lynn heard about this, and correctly sensing we might not want to wait, Lee offered to do the recording himself. He went right out to buy a microphone and promptly returned to set it up through the computer. Since the recording of our singing Francis’ favorite Beatitude chant had gotten truncated the day before, singer-songwriter Mike Nobel rerecorded our singing it the following day. Here is the transliteration of this Beatitude by Saadi which we especially liked: “Blessed are the pure in heart, (those whose heart has a deep sense of passionate purpose and the audacity to feel abundant inside), they shall see God (in a flash of insight, — everywhere). One should realize this is a man, now getting hospice care, who is singing — only ten days before he died.